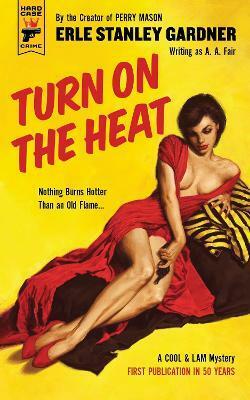 From the world-famous creator of "Perry Mason," Erle Stanley Gardner - at his death the best-selling American writer of all time - comes another baffling case for the Cool & Lam detective agency: TURN ON THE HEAT. Return to the sizzling 1940s as Bertha Cool and Donald Lam investigate a missing woman, a desperate husband, a politician with a past, and a femme fatale with a future...assuming she doesn't go to jail for murder! Featuring brand new cover art that is a posthumous collaboration between Laurel Blechman and the legendary Robert Maguire - the first new Maguire cover in decades! A must for Gardner fans - if for no other reason than to demonstrate the breadth of Gardner's inventive skills when he wasn't busy with his better known lawyer/investigator. For those a little less passionate about Perry Mason, the Cool and Lam mysteries are a wonderful example of the kinds if mysteries that helped define the genre during its formative years. One of the best-selling authors of all time, Erle Stanley Gardner's greatest creations include crusading attorney Perry Mason (star of more than eighty novels, a TV series and TV movies) and the hardboiled detective team of Bertha Cool and Donald Lam, who appeared in more than two dozen adventures. An attorney himself, Gardner also founded the Court of Last Resort, a group that investigated criminal cases they believed had ended in wrong convictions.